I know recycling is not new, but creating something from our recycling bin was a brand new activity for my little man and he loved it! We sat on the kitchen floor, took the stuff out of the bin to see what we could use. 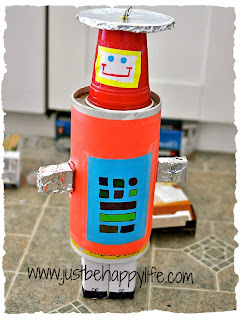 We ended up using an oatmeal container for the body, two pie crust boxes for the legs, two little raisin boxes for arms, a cup for the head and the lid of the oatmeal container for the hat - little man insisted that the robot had a hat, no problem! I grabbed some construction paper, tin foil, tape and markers to make what used to be our garbage come to life in a robot form. I don't know how long this robot will be around before it goes into the recycling bin again, but as of right now it's in the living room among some of the little man's favorite toys.